Up and Down Tilt Mechanism. Specially designed High Torque Motor. The Orient Mini 16 stand fan enjoys a neat and attractive design that will easily blend into your existing room d?cor. This fan comes equipped with an extra powerful motor combined with aerodynamically designed metal blades to ensure maximum air delivery. Other features include 3-speed rotary switch, adjustable tilt mechanism, powder coated guard and polymer ring for extra protection against corrosion, telescopic arrangement for full height adjustment, and motor protection through thermal overload protection device. The Orient Mini 16 stand fan enjoys a neat and attractive design that will easily blend into your existing room d?cor. 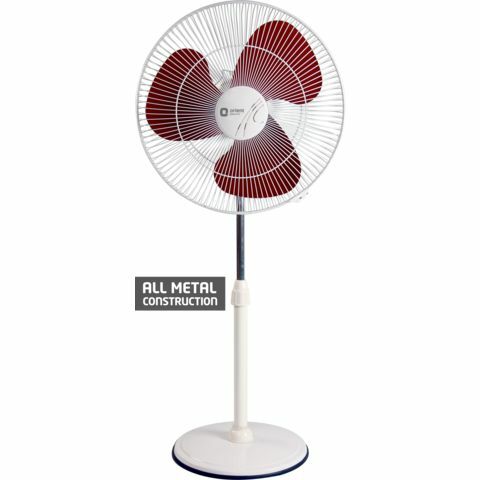 This fan comes equipped with an extra powerful motor combined with aerodynamically designed metal blades to ensure maximum air delivery. Other features include 3-speed rotary switch, adjustable tilt mechanism, powder coated guard and polymer ring for extra protection against corrosion, telescopic arrangement for full height adjustment, and motor protection through thermal overload protection device.